Several years ago, Mother Earth News published an article with the results of nutritional analysis done on the eggs from true grass-fed, pasture-raised chickens compared to store bought eggs. Read the whole article HERE. The results showed that chickens allowed to roam freely and eat grass and bugs lay more nutritious eggs that contain 1/3 less cholesterol, 1/4 less saturated fat, 2/3 more Vitamin A, two times the omega-3s, three times the Vitamin E and a whopping SEVEN times the beta carotene of store bought eggs! While I would love to let my chickens roam our six acres foraging for food all day, if I did soon we wouldn't have any chickens left. There are just too many predators to allow that, so they are confined to a large run all day with plenty of feed, clean water, sun, shade and spots to take dust baths. However, there hasn't been a single blade of grass in the run since the week after the chickens were introduced to it nearly five years ago. I give our chickens healthy treats, mostly kitchen leftovers or garden trimmings, and cut herbs. 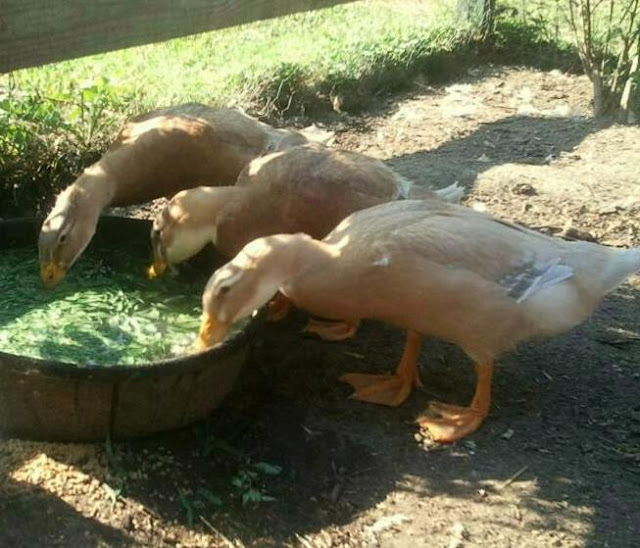 But with food prices rising and a ever-growing flock of hens and ducks, its just not economical to purchase commercial treats or produce at the grocery store for them very often. 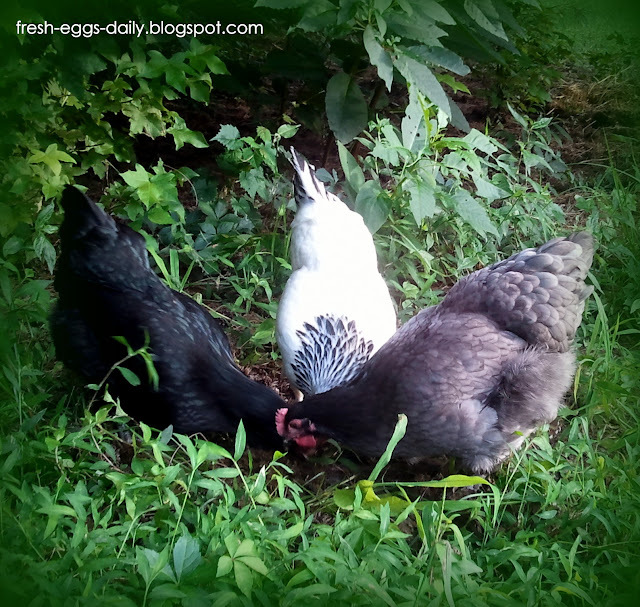 With the cost of chicken feed going up also, I started wondering if there were any way I could simulate a little free ranging for our chickens inside the run, while saving some money and also resulting in more nutritious output from them (eggs!). So I did a bit more reading. Eggs laid by chickens who consume grass have a better hatch rate. The eggs have darker yolks and literally taste better. 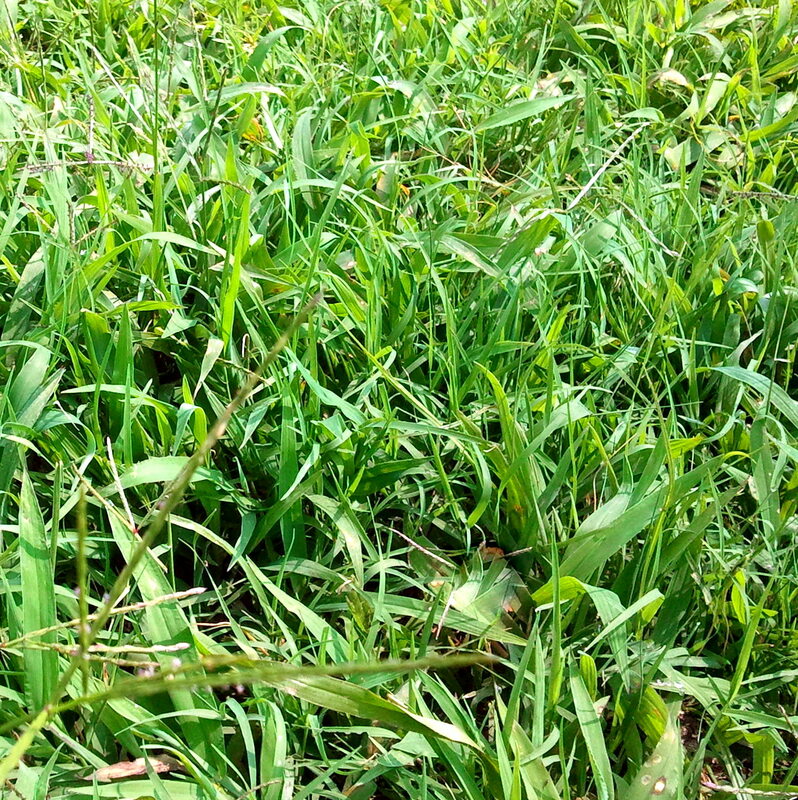 Grass can actually provide one-quarter of a hen's overall daily nutritional requirements and fulfill ALL of her protein needs in the form of amino acids that are converted to protein in the body as well as nitrogen molecules from the soil. 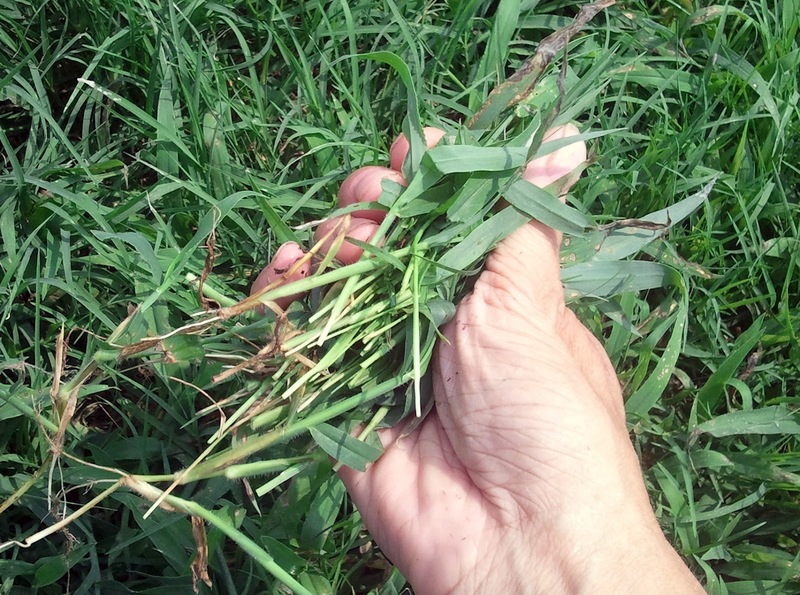 Ryegrass, for example, has a 12-16% protein content. Grass also provides Vitamins C and E, magnesium, iron and phosphorus. Typically, grass has 33 calories per 100 grams (roughly 4 calories per ounce) and 3.3 grams of carbs, 2.2 grams of protein and a whopping 4.6 grams of fiber. And therein lies the one downside to grass - the fibrous consistency. The long fibrous strands can get stuck in chickens' crops and lead to sour crop or impacted crop. Read more about both potentially fatal conditions HERE. 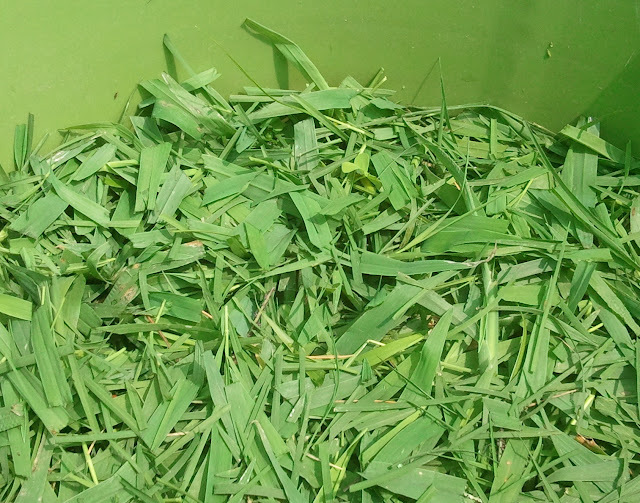 - Cut grass strands into very small pieces shorter than 1"
Did you know that free ranging chickens rarely suffer impacted crops? That's because they nibble a tiny bit of the grass off the end of each blade. So grass needs to be fed straight from the ground, or cut into short pieces. Never grab a handful of grass and toss it into the run. You are just asking for trouble. I have been cutting and feeding the grass to our flock for a few weeks now, bucketfuls at a time. I toss it on the ground for the chickens and into a tub of water for the ducks. And lo and behold, they are eating less feed. They still need access to layer feed, as well as a calcium supplement (either crushed oyster- or egg-shell), but they eat noticeably less feed. In addition to providing a super healthy food source for them, I am cutting back on our feed bills as well. 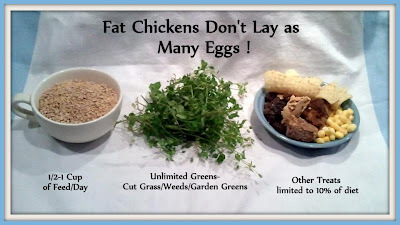 'Green' treats can be fed in unlimited amounts to your chickens, so go ahead and liberally cut grass and weeds for your chickens, every day if you want to, as much as they will eat. They won't get fat. Weeds are also a very nutritious food source. Read more HERE. Here in Virginia, we pretty much have grass year round and also some nice winter weeds. In the coming weeks and months as food prices are expected to rise, I know I can depend on a FREE nutritious supplemental food source for our chickens. You always teach me something! Thanks, and my girls thank you to! Audrey here, I have been doing this since my girls were little. With arthritis in my hands it's painful to every day cut the grass, but it's good for my girls so I do it! I usually cut it up while I'm waiting for the horses to finish eating and get turned back out or while I'm watching TV. I've tried giving them grass from the lawn clippings, but they don't like it. I started growing some buckets of weeds and grass and when they get nice and green I give them the buckets (takes weeks to grow) and they jump up on them scratch the dirt out etc. and them I let the buckets rejuvinate and we do it all over again. :-) In the meantime, I keep cutting! Do you use grass shears to cut the grass ? I am going to try this soon. Our crossbeam will love it since it will be so much easier for her to eat this way. Yes I use a pair of garden shears. I wish I had green grass but alas I am in the drought zone and my lawn is completely fried. It sounds like I am walking on corn chips when I walk across the lawn! I have been giving my ducks lots of chopped swiss chard from my garden and I wish I had planted more so I could give my chickens and turkeys more than the occasional snippet. I haven't even purchased my ducklings yet, let alone started gathering or selling eggs but I have already learned bunches from your site. Thanks and keep it comin'!! I have different kinds of grasses and weeds growing in big pots that I put in their run besides pulling weeds and giving them some greens from our garden. I rotate the pots to let them regrow and then put them in the run again. Love the idea of the Envirocyle Composter making ready-to-use compost tea! Although since we got chickens, out composting has been reduced because the dear hens help us eat off our land, we still love composting on site and not bringing in anything from off site if at all possible. This is a great post - thanks for doing all the research! 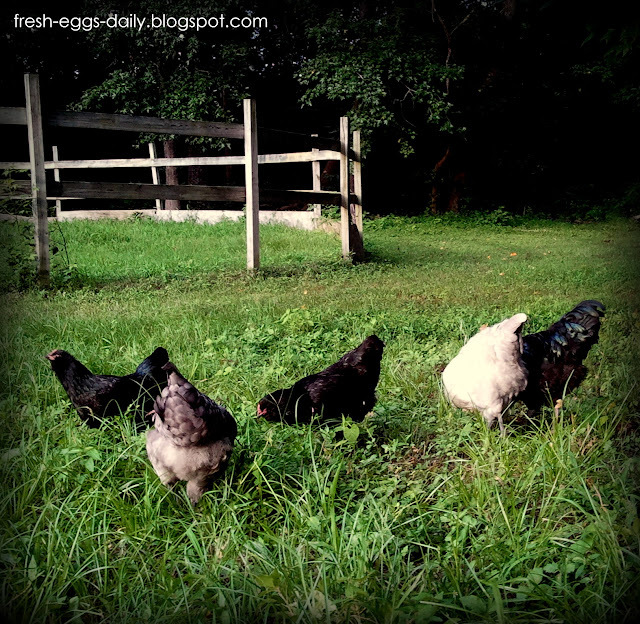 Our chickens roam free, though we do have the predator problem you mentioned, plus the problem of them laying their eggs in secret hiding spots. However, we have two sets of moms with chicks that are enclosed for their safety. This has inspired me to cut grass to feed them - we are going through feed more and more quickly and it is EXPENSIVE! I love reading your blog-it's fun and informational too! 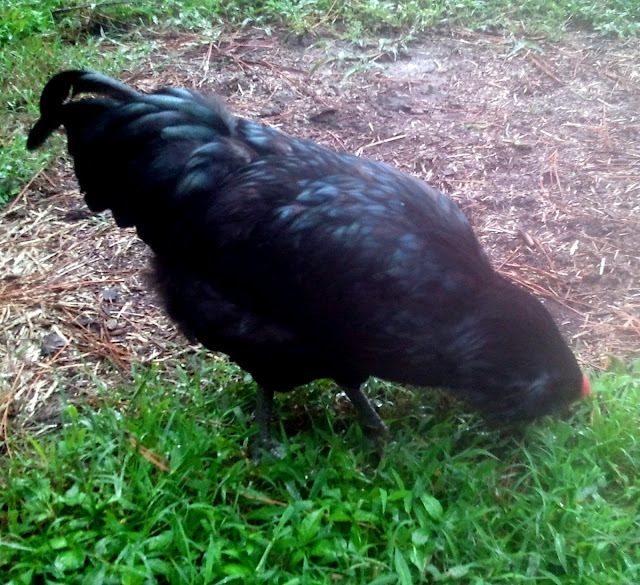 Plus, I love to see what your chickens are up to through all of the photos. I plugged your blog on my blog!! No we have 21 hens plus a rooster and 8 ducks so it would have to be a huge tractor! Not a big fan of the tractors because it doens't allow them much space to move around really. I know they're always on new grass, but still, I would rather they be in a huge yard like where we have them now with supervised outings into the pasture each evening.